“No battle plan can anticipate all contingencies. There are always unexpected factors including those stemming from the opponent’s initiative. A battle must thus become a balance between plan and improvisation, between error and correction. It is a narrow line. But it is a line one’s opponent must also walk. It will come as a total shock to the readers of this blog, I’m sure, that I like Star Wars. In fact, I like it in many different forms, and have for a very long time! But only in the last couple of years have I really started to dive into Star Wars books, both Legends and new Canon. I had heard quite a bit about the Chiss Ascendancy and Thrawn before I ever managed to pick up Timothy Zahn’s exceptional book of the same name. It remains one of my absolutely favorites. 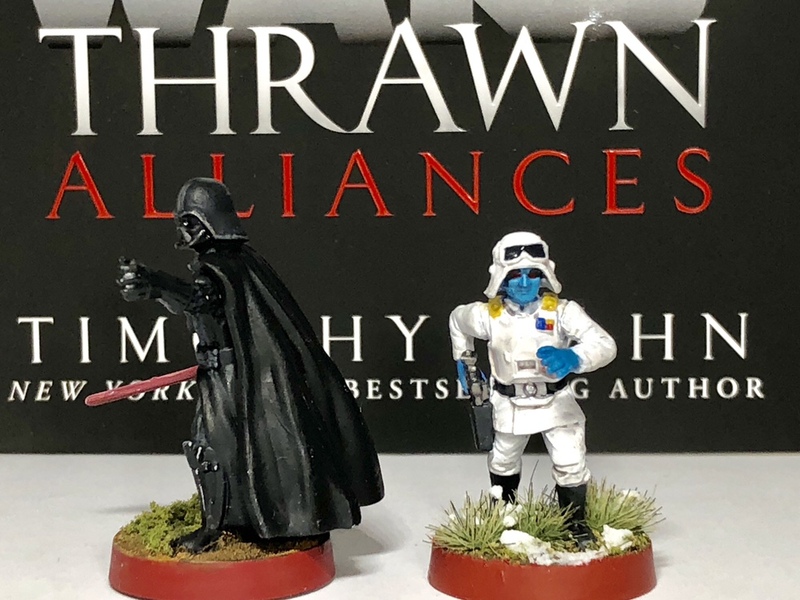 And so to celebrate last week’s release of the much-anticipated sequel, Thrawn Alliances, (and since I was convinced the next announcement would be Thrawn, not Palpatine, so I held off on doing this) I thought it would be fun to present a quick and dirty guide to painting your General Veers figure like the Grand Admiral himself. This is the image I used as reference: Thrawn’s sweet, sweet battle armor from the Rebels third season finale “Zero Hour“. The armor itself is basically just an extension of the crisp, clean all-white Grand Admiral’s uniform as part of the Imperial Navy. Contrasted with the green/grey Army uniforms seen on Veers, it really stands out on the battlefield and is reasonably easy to paint. The scheme itself really relied on a few key color combos: gold and white, then black and silver. The gold pauldron stripes really sell the overall aesthetic, and the black boots with silver belt buckle and gun help contrast the lightness. I used Vallejo Yellow Ochre for the pauldrons, Vallejo German Grey for the “black” boots, goggles, belt, and gloves, Citadel Stormhost Silver for his belt buckle, and Citadel Leadbelcher for his gun. To compensate, I just squashed three columns into two. It looks fine from a distance! For Thrawn’s iconic Chiss face, I used Vallejo’s Aquamarine, but Citadel’s Temple Guard Blue would also work just fine. Furthermore, while I basically never paint eyes on my minis, the Chiss have very noticeable bright red eyes. Don’t forget to include them! For washes, I did a very thin 3:1 Lahmian Medium and Nuln Oil combo for the white parts, straight Nuln Oil for the boots, gloves, and gun, and used Citadel’s Drakenhof Nightshade for the face. I did quick highlights after, but nothing too serious – there’s already a lot of white here. And last but not least, I used Vallejo’s Gloss Varnish (in a dropper bottle) to give a nice sheen to the belts, armor, goggles, and helmet. This is obviously optional, but I found that it helps distinguish just a bit with an all-white color scheme. And there you have it! 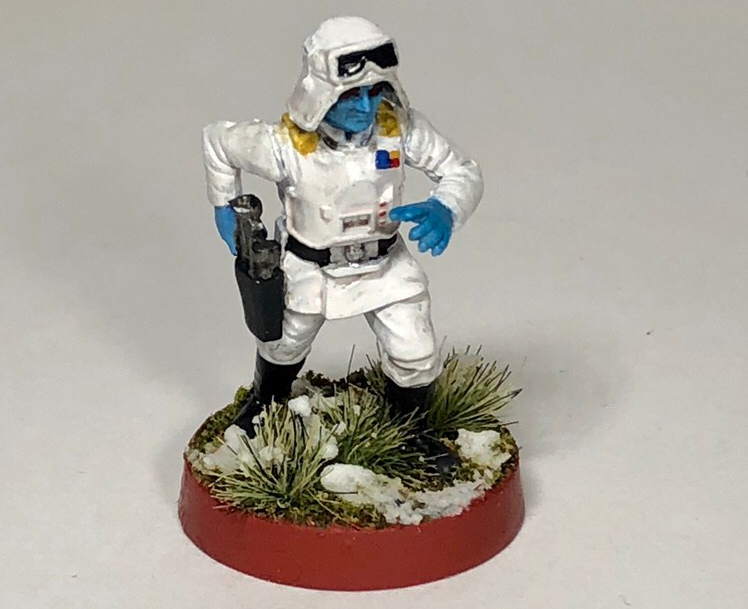 I’m certain you all can do better than I did in about an hour, and if you do make your own Thrawn repaint I’d love to see them in the comments or on Discord.